Retire in Arkansas is a state that many overlook when choosing the best state to retire in. That is a shame because the state offers a lot to the retiree on a limited budget. If living well and cheaply is on your radar, at least check it out. My mother and father grew up here in a small town...Bellefonte (Harrison area) which had a one room school house...I have many fond memories of the beauty of the Ozarks and the warmth of the people. When you think good folk, think of Arkansas. They are friendly and they will make you feel welcome as well. 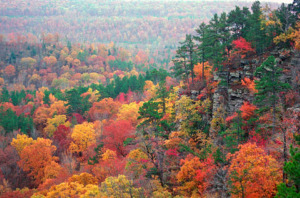 This is truly the Ozarks...the scenery is beautiful...check out the fall colors. Each year the trees give up their color before the usually mild winters arrive. The climate is moderate... 40 in January, 81 in July, 45 inches of rain and 5 inches of snow on the average. It is below the path of Tornado Alley. How frugal is it to retire in Arkansas? Living is cheap in Arkansas because it has a low average annual income. What the residents lack in money they make up for in strong family values, church activities. The benefit to you is that you are in the same boat with a lot of other people who are watching there pennies. RV and Park model living are available here of course. Home prices are not out of site in Arkansas like in other parts of the country, with lots of options for the retiree who has $100,000 to spend on a home. This is the Mildred B. Cooper Memorial Chapel north of Eureka Springs. It is a tourist attraction in itself. 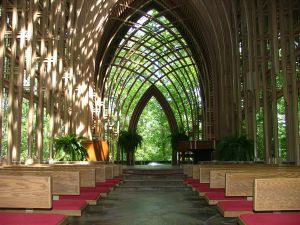 If know someone that would like to get married in this beautiful church, I hope they are patient. June weddings have a 5 year waiting list. Now that's a long engagement period! 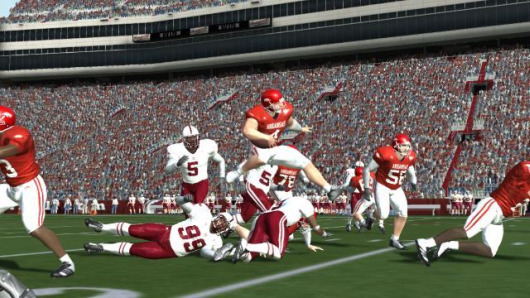 You just have not lived until you have been to Fayetteville, the home of the Arkansas Razorbacks, on any given Saturday in the fall. Football is a big deal in Arkansas...and you too will be calling the Hogs...Pigs, sooie, sooie. You don't have to be a rabid Razorback fan to live here... But it sure helps. Around the Mountain Home area is some of the finest fly fishing for trout you will ever find. 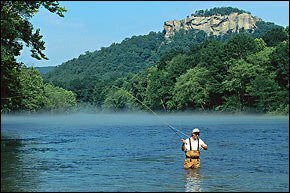 The tail waters of Bull Shoals and Norfork dams are teeming with brown and rainbow trout. The lakes themselves are known for their fine bass fishing. Retire in Arkansas and fish! Retire in Arkansas, what city should I pick? If you want a gated community of 15,000 spread out over 26,000 acres. Hot Springs Village, the world's largest gated community, is worth a looksee. You can find townhomes from the $70,000s and 9 golf courses to choose from. Golf costs $26 including your cart, cheaper on average than we pay in Arizona. Here is a good real estate source for Hot Springs Village from someone who is native to the area. It is not just for retirees, with 400 children living there. 200 service clubs and organizations are represented here. For your spiritual needs there are 26 churches to choose from...did I mention Bible belt? If you do not require or like the gated communities concept, my favorite area is Mountain Home. We were passing thru in our RV on 9/11. We decided to hunker down for a while there...the people were great and we made the best of a difficult time. 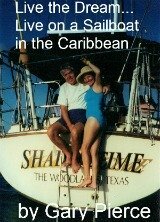 Retire in Arkansas if you want active retirement at a frugal living price. The people are warm and friendly, very community oriented and would welcome you too.